Back pain is one of the most common musculoskeletal conditions among office workers. 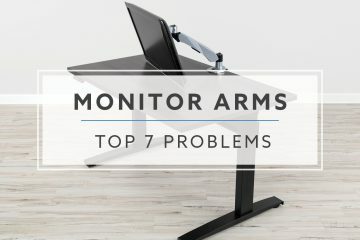 You might be fortunate enough to use a sit to stand desk, but working for several hours can still cause problems. Whether you’re sitting or standing, the muscles in your back and legs can become tight causing increased strain in your joints. Using a standing mat and taking breaks will help, but stretching is a more direct way to address these symptoms. Stretching exercises can improve your back pain and increase your flexibility. Here are twelve excellent stretches that you can do in standing, sitting, or on the floor. Standing is one of the best ways to reduce your risk for back pain at work. 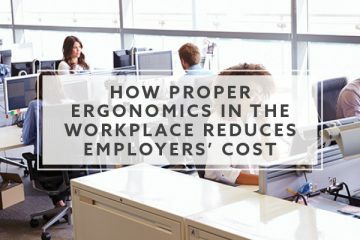 Even if you have to sit for most of the day, it helps to take breaks to stand and walk around. 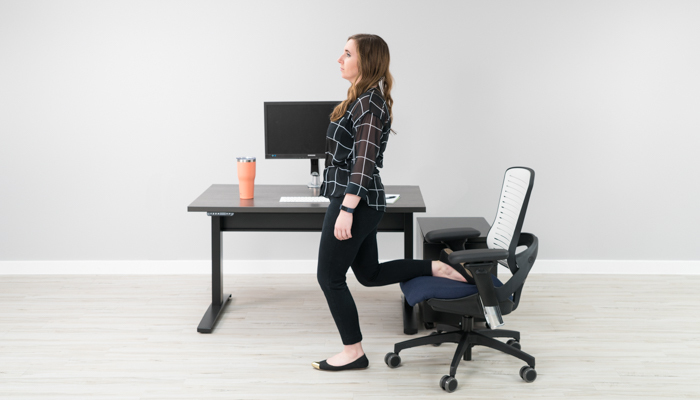 While you’re standing, you can try these two stretches to reduce pressure in your lower spine and improve your flexibility. Stand with your feet shoulders width apart. Place your hands in the small of your back for support. Slowly lean backward increasing the arch of your lower back until you feel a mild stretch in the abdominal muscles and slight pressure in the lower back. You can perform this as a static stretch by holding for 15-20 seconds, then repeating it 3-5 times per session. To perform this as an active range of motion exercise, hold for only a few seconds, but perform 10 repetitions per session. 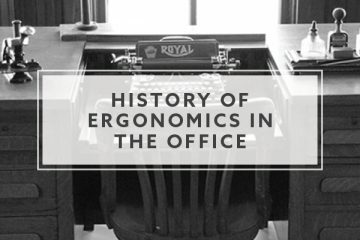 While standing, hold onto to your desk for support and put one foot up on a chair behind you. Depending on your flexibility, you can place the foot on the seat, arm, or back of the chair. Make sure that the foot on the ground is pointed forward with the knee bend slightly. Slowly push your pelvis forward while contracting your glutes. You should feel a stretch on the front of your hip and thigh. Hold this position for 15-20 seconds, then repeat 3-5 times on each side. Sitting is the most common position for most office workers. As mentioned above, standing and taking breaks will help reduce your low back strain and risk for injury. However, there are a few exercises that you can do while sitting to improve pain and flexibility. While in a seated position, raise one arm over your head. Place your other hand on your thigh for support. Slowly bend to the opposite side until you feel a comfortable stretch along the side of your trunk. Hold the stretch for 15-20 seconds, then repeat 3-5 times on each side. While sitting in a chair, raise one knee as if you are marching until you can reach it with your hands. Use both hands to pull the bent knee up toward your chest until you feel a gentle stretch in the lower back and back of the hip. Your hands can be on top of your knee or behind your knee for comfort. While seated, rest your heel on the floor with your knee straight. Gently lean forward until a stretch is felt behind your knee/thigh. You should keep your low back straight to focus the stretch on the hamstring muscles. Hold the stretch for 20-30 seconds, then repeat 3-4 times on each leg. Seated in a chair, cross one leg on top of the other so that your ankle is sitting over the opposite knee. Place one hand on the knee of the crossed leg. Gently lean your trunk forward while pressing gently on the crossed knee until you feel a mild to moderate stretch in the hip and buttock area. Sitting and standing exercises are practical and can be performed in nearly any setting, but stretching on the floor can be even more effective. If you have a private office or a clear area of floor available, these stretches will allow you to stretch more muscle groups in your trunk. While lying on your back, slowly bring one knee up toward your chest. Grasp the knee with both hands (either on top or under the knee) and gently pull it up towards your chest. You should feel a mild to moderate stretch in the low back, hip, and buttock. While lying on your back, slowly bring both knees up toward your chest. Grasp the knees with both hands (either on top or under the knee) and gently pull them up towards your chest. While lying on your back, slowly bring one knee up toward your chest as you did with the single knee to chest stretch. Grasp the knee with both hands (either on top or under the knee) and gently pull it up across your body toward the opposite shoulder. You should feel a mild to moderate stretch in the low back, hip, and buttock (usually a stronger stretch in the buttock region on this one). While lying on your back, keep your feet and knees together with your knees bent. Gently lower your knees to one side until you feel a mild to moderate stretch in the opposite side of your low back and hip. Start on your hands and knees with your hands in front of your knees. Slowly lower your buttocks towards your feet until you feel a mild to moderate stretch along your mid and lower back. Hold the stretch for 15-20 seconds, then repeat 3-5 times. Start on your hands and knees as with the prayer stretch, but place both hands to one side. Slowly lower your buttocks towards your feet until you feel a mild to moderate stretch along the opposite side of your mid and lower back. To stretch the other side, move your hands to the opposite side and stretch again. Whether you spend most of your time in sitting or standing, you might experience episodes of back pain while working. Changing positions, taking breaks, and walking are still great ways to relieve strain, but performing the stretches explained in this article will improve your flexibility and reduce your risk for back pain.